It’s probably safe to say that you can count the number of worthy film remakes/reimagining’s (John Carpenter’s The Thing and Peter Jackson’s King Kong immediately spring to mind) on one hand. It’s also just as safe to say that many hold Dutch auteur Paul Verhoeven’s 1987 RoboCop in high regard, endearing audiences of a certain generation with its cutting social satire, lashings of X-rated ultra-violence and an absorbing story about the loss of humanity and exploration of the soul – all set against the futuristic backdrop of a gritty crime-ridden city with a greedy decadent corporation holding the economical purse strings. Sequels and television spin-offs have failed to capture the spark of the classic original and finally a new cinematic iteration of the Robocop franchise has emerged from the gates of development hell. I approached this new version with caution yet was quietly optimistic that studio MGM would have a hit on their hands that would refresh the franchise without straying too far from its roots. Sadly, 2014’s RoboCop fails to deliver on numerous fronts, although it does retain some of the elements that made the original great. There’s an almost unhealthy dose of political satire and social commentary (mainly delivered via Samuel L. Jackson’s Media Break-esque vignettes peppered throughout) that certainly resonates and offers debate on issues of the times and of course the soul-searching exploration of Alex Murphy’s lost humanity as he comes to terms with his new ‘condition’. However, heavy focus on the latter draws out the pacing and whilst there are still some meaty action sequences the film arguably suffers from its tame 12A (PG-13 in the U.S.) certification. Unfortunately, Kinnaman seems to be the weakest link delivering a rather static and lifeless Murphy/Robocop (compared with Peter Weller’s understated yet nuanced performance in the original) and the script’s expansion of Murphy’s home life and family relationships are ultimately uninteresting and emotionally flat. Crime boss Antoine Vallon (Patrick Garrow) is also a fairly weak villain who lacks gravitas and undermines Murphy’s quest for vengeance against his attempted murderer. Thankfully, Michael Keaton, Gary Oldman and Samuel L. Jackson all turn in reliably great performances. 2014’s RoboCop is technically superior given the evolution of effects technology over the last 25 years, Murphy’s jet black Dark Knight style Robo-suit I thought to be a generally exciting (although the flip up/down at will visor a big mistake) update of the iconic shiny silvery blue original and the ability to tap into CCTV feeds a neat addition as well as Robo’s sleek new bike. Albeit, Detroit City itself is far too clean, crisp and orderly, lacking the physical and social decay we’d expect (and thus providing a reason for the existence of a Robocop). Director Padilha delivers some well-staged, pacey and frantic action sequences (including Murphy’s ‘training’ and the climactic showdown between Robo and a couple of ED-209’s) and it’s a real shame that there weren’t a few more to tighten the overall flow of the film. As I’ve cited above, the script certainly attempts to capture the soul of the original RoboCop yet it feels empty and its riffs of those afore-mentioned elements of the original never quite hit the mark – a cheesy reworking of the RoboCop theme music and clumsily handled nods to the original notwithstanding. 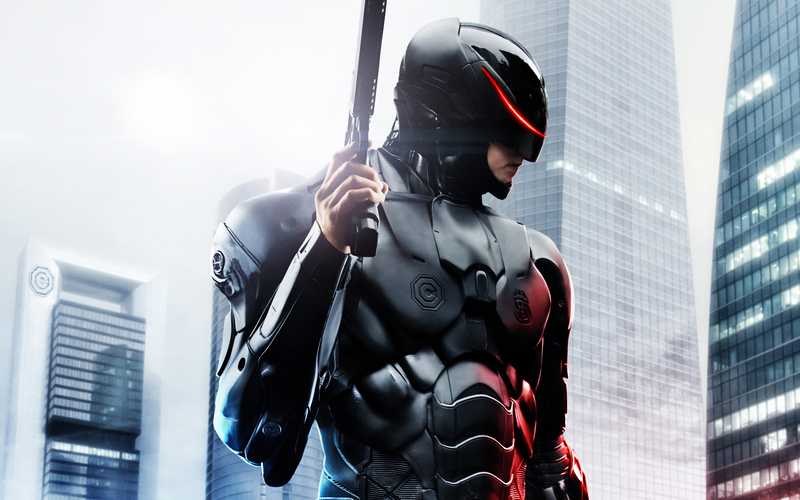 The bottom line: 2014’s RoboCop more or less offers the same ingredients as the 1987 original but the recipe isn’t quite the same, more often than not leaving a sour taste in the mouth. With a stronger central lead, a tighter script and a larger measure of action it could have been great – approach with caution! RoboCop is in cinemas across the UK now and is released in theatres in the U.S. on 12th February. What did you think of RoboCop? Share your spoiler-free thoughts below!